The campsite "Portu Tramatzu", from which you can go directly to the beach, offers: Toilets, hot and cold shower, washing machines, bar, market, restaurant-pizzeria, discotheque, children's playground, entertraiment programme, tennis table, caravans to rent, ample room for each tent and caravan, together with electrical points, barbeque facilities. The opening dates are shown on the campsite price-list. The port, separeted by a promontory, is about 100 metres away. 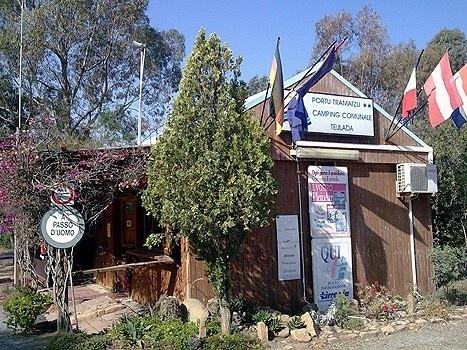 Boats and canoes for hire, diving-centre, boat trips, also available. The small town of Teulada is 8 km away from the campsite, where you can find medical-assistence, camping-gas supplies, folklore, local specialities. In the neighborhood you can find many lovely walks, interesting also from an archeological point of view, like "IS ZUDDAS" caves, or have a holiday on Matteus' farm. 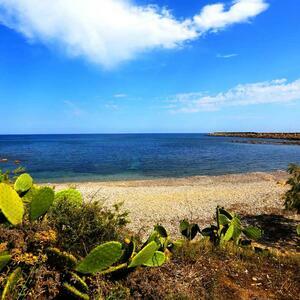 The campsite can be reached from Cagliari by taking the 195 route, or, if you want to enjoy the spectacular south-coast, take the coast-road wich startsfrom the Chia cross road.